Just dropping you a line to let you know what great customer service I received today from Stephanie and the other day, from Iris. Coming from the customer service field(managed a customer service center for a major food company for 29 years) I can appreciate what good customer service means to a company. It was a pleasure doing business with them and if the vacuum I ordered is half as good, I'll be more then happy with my purchase. Thanks again, they both deserve an "atta girl"
Robert I wanted to share with you this unbelievable picture. I have a 2300 square foot single story home with 3 and ½ year old berber carpet. I have been using a $600 Royal upright since we moved into the home and have had the carpet steam cleaned once or twice a year since we moved in. Since I bought the home to live in for a very long time, I thought I would invest in a central vacuum system since I have always heard they do a much better job and last forever. I shopped locally and on the internet and eventually found Think Vacuums. I was very happy with the communications I got over the phone from you and other employees as I was asking many questions about Central Vacuums. You and your team not only answered my questions but did a great job helping me select the proper unit for my home. I am a mechanical kind of person so I knew I would be installing it myself, so it was important that I received all the proper installation material and picked a vacuum that would do a good job. I selected the Drain Vacuums Viper model. After completing the installation and testing the unit, I cleaned the unit because I wanted to see just how much dirt this new machine would remove from a carpet that I thought I was already cleaning properly. Look at this picture(Above). The dirt pile on the right picture is about a ¼ inch thick. This of course does not include the dirt that is still in the Viper filter. I didn’t want to remove that since this was the first time. Remember all I did was vacuum the floor one time, I have not gone back with the other attachments to clean the edges of the carpet up next to the wall. I also love the turbo head and the way it cleans. Also the adjustment on the handle that allows you to reduce the suction is great for doing throw rugs and other loose carpet. I am so very impressed with this machine and am very happy with the service I received from you and your company. Thanks again. Sebo Felix Onyx has all the features of the lightweight Felix fun, with a newer more modern design. Lithe, nimble for on-hand maneuverability. The SEBO Onyx goes from 90° vertical and 180° horizontal with a height of less than six inches. The Sebo Onyx vacuum is flat and flexible, allowing you to reach underneath the bed and other furniture. The Felix's adjustable turning swivel neck allows audacious maneuverability, which will allow you to clean in areas that were previously inaccessible. Carrying handle and light weight so Onyx feels right in either hand. Big and small, left and right hands can grip this ergonomically shaped handle the same firm way. While vacuuming with the integrated hose handle, you can easily switch the Sebo Onyx to your other hand. And at less than 10 lbs. (depending on attachments used), the SEBO Onyx is comfortable either way. A Telescopic handle for short or long reaches helps get those hard to reach places. Turning swivel neck for on-hand maneuverability of 90 degrees vertically and 180 degrees horizontally. The Felix features an ET1 12-inch power brush with four-level height adjustment that will help clean any surface from hard floors to deep pile carpet. There is a Parquet brush that will clean sensitive, smooth hard floors almost without touching them. The superior air quality with S-Class, 3-step filtration which is ideal for those with allergies and asthma. To view other Sebo Felix Vacuums, please visit our Sebo Felix Series page. If you wish to view our extensive lines of Vacuums, please visit us at Think Vacuums. 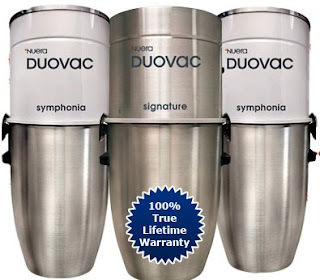 The bestselling line of Central Vacuum Systems available in the United States is the Duovac line. There is a 100% True Lifetime Warranty on Everything. This is the industry best for Central Vacuums. All Duovac Central Vacuums feature New, more powerful motors with high efficiency. They also feature German Engineered Filtration systems with superior capture of allergens, bacteria and moisture. Their modern and distinctive look set them apart from other Central Vacuum Systems. For 15 consecutive years, from 1995 through 2010, Duovac has been a Consumer's Choice Award winner for Business Excellence. Duovac features an exclusive network of almost five hundred central vacuum companies with experienced technicians. This network is available at no cost to all Duovac customers to assist in your installation of any future service need. Red Carpet Customer Service is number one for all Duovac users. The Duovac line of central vacuums features a powerful American made, Ametek Lamb motor with a double stage fan system. These engines feature Maximum Suction power while being exceptionally quiet. All Duovac Central Vacuums come with a Revolutionary Sound Suppressing System. There is a Motor Overload Safety Reset Button, and an LED Performance Display. This high performance filtration system traps 97.5% of particles as small as .1 microns. Allergens, Bacteria, and moisture are trapped providing superior air quality. The filter is a permanent filter that is washable. It also features True HEPA filtration. This system features a hybrid design that can be used with or without a filtration bag. 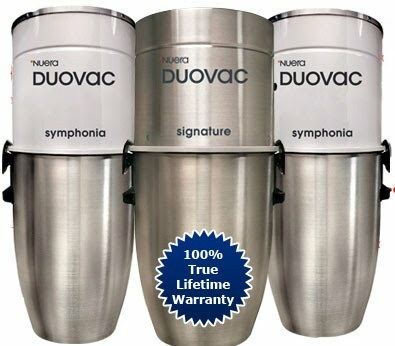 The Features and Benefits of owning a Duovac system are exceptional. All metal construction is used to insure that heat is dissipated efficiently, this will extend the life of your system. The Tangential Exhaust gives optimal cooling to the motor, which also gives it greater durability. The motor is equipped with an anti-vibration system that reduces noise. The Interior and Exterior have baked Epoxy paint. This makes the exterior easy to clean with a damp cloth. It is also Scratch resistant. The surface is also non corrosive and will resist punctures due to rust. The Chrome handles are also non corrosive, and facilitate easy emptying. Finally, there is a Large Capacity Duomax dirt receptacle. It has an oval shape increasing cyclonic action. The capacity is up to 36 liters, which will reduce the number of times you have to empty it. On average, this system only needs to be emptied twice a year. We highly recommend this Top of the Line Central Vacuum System. Its features and benefits will offer outstanding value and service to you and your family for years to come. One of the Best Canister Vacuums available today is here and ready for you to enjoy in your home. 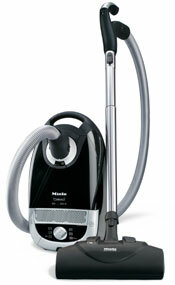 If your looking for a premium Miele Canister Vacuum, then you need to see the Miele Callisto S5281. there are many features on the Miele Callisto S5281. There is a Multi-Layer Filtration System, that includes a 3 layer HyClean Bag, an Electrostatic filter and a special exhaust filter. The vortex motor is both powerful and efficient in the Miele Callisto. Six motor speed setting are available and they can be controlled through a LED lit remote. There is a direct connect electric hose on the Miele Callisto S5281. All of your accessories work together, the cleaner, hose, electric wand, and power brush to make even your toughest vacuum jobs a snap. There is a covered storage for your attachments. This Miele Canister vacuum has 3 wheels that swivel independently allowing the vacuum to swivel and follow you in any situation. The extra large diameter hose of the Miele Callisto S5281 works well with the large bag compartment and filter for increased airflow. Miele Callisto S5281 has a One Year limited warranty on repairs, and Seven Year limited motor warranty which should give any owner a great sense of comfort when buying this model. All S5 vacuum cleaners, including the, Miele Callisto S5281 are manufactured at Miele's Bielefeld factory in Germany. Every effort is made to embrace the company's 107-year motto of Immer Besser or Forever Better. Before any production process begins, all components of the Miele Callisto S5281 are put through rigorous tests and subjected to enormous strain' stress that exceeds typical residential household use. All unit's, including the one you buy is put through a final quality test, not just one in every hundred or two per production run, ensuring that your home is not a testing ground.